Asphalt is a hot commodity that has found many applications throughout the world due to its cost-effectiveness, ease of installation, and effective repair methods. One of the best of these maintenance methods that our company, Houck Asphalt Maintenance, can deliver is infrared asphalt repair. There are a host of benefits to this type infrared asphalt repair procedure through Houck Asphalt Maintenance, which will keep your surface functional and looking great for many years to come. Time is valuable in all areas of business including infrared asphalt repair, and so it is important that infrared be used for it has a reign over traditional resurfacing in this respect. Parking lots are especially sensitive to time management and so if this is an area that needs repair, then as an astute business owner you should look towards infrared asphalt repair to get the job done quickly and have customers back in the vicinity in no time. Some customers would find it an inconvenience having to park elsewhere where they might decide that the hassle is just too much to concern them with. The affected area will be swept or blown clean to rid the space of any loose aggregate, sand or water which has since made itself to the surface and would otherwise provide a hindrance to the infrared asphalt repair process. Then the infrared part of the infrared asphalt repair process comes in and heats the area to the appropriate temperature, 325 degrees in most cases, for a short interval of about 5 to 10 minutes. After this heating process there may be more failed aggregate that makes itself known and that is easily raked away and a rejuvenator applied to compensate for lost oils and such that all of the weathering may have caused. 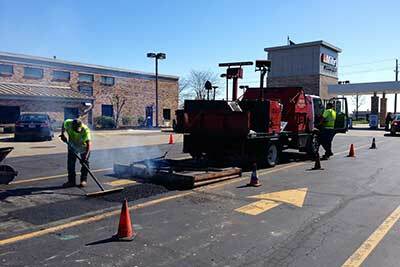 Next, during the infrared asphalt repair, fresh asphalt is then put into place with proper raking and grading measures taken to get everything at a proper level before compacting with a multi-ton vibratory roller or similar equipment. That is really all there is to the infrared asphalt repair process and you can reach all of the troublesome areas within a short time-frame in order to eliminate unsightly and risky spots such as those from pavement heaving, catch basin uneven surfaces, or rough surfaces due to vehicle traffic. 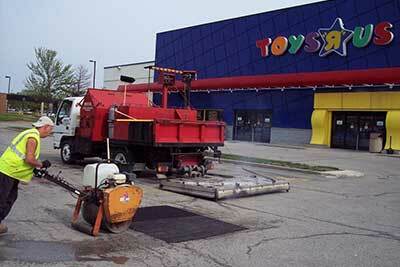 Seamless repairs are the name of the infrared asphalt repair game such that no openings are left for future damage to be caused by water penetration and other erosive mishaps, but if they do Houck Asphalt Maintenance will always be ready to work with you again on the infrared asphalt repair. The patch will return to a normal temperature in no time and traffic resumption can take place as if nothing ever happened. Houck Asphalt Maintenance is, of course, a leader in the industry who can provide competitive prices for all infrared asphalt repair procedures. The savings in raw materials alone can be enough to make infrared asphalt repair a viable option in order to keep everything beautiful. 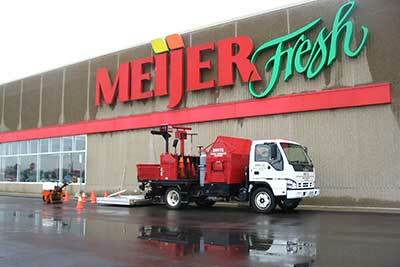 We follow all of the well-known and trusted infrared asphalt repair guidelines during the process. For example, multiple layers must be heated individually to insure that the lower level can receive sufficient heat for removal. The infrared asphalt repair mix (percentage and properties) is another important thing to look at as this can significantly affect heating times. What that means is that if your working with aged white asphalt then it will take a little longer to absorb the heat than the black new material. There is no need to worry about all of these details, however, since the experts in our infrared asphalt repair company will work out these specifics for you. Give us a call or email today at Houck Asphalt Maintenance in order to get infrared road repair (IRR) or infrared asphalt repair for all of your important areas. Our customers have always been highly satisfied and return time and again for all of their infrared asphalt repair needs at Houck Asphalt Maintenance.